The home secretary has refused to say whether the Conservative manifesto will repeat their 2015 pledge to cut net migration to the "tens of thousands". Amber Rudd told the BBC the manifesto was "not going to be identical to the last one" and said things had changed since 2015 because of Brexit. The target, set by David Cameron in 2010, has never been met and recent figures put net migration at 273,000. The PM indicated in April that she would stick with the aim. Speaking on a campaign visit last month, Theresa May, who was Ms Rudd's predecessor as home secretary, told the BBC: "We want to see sustainable net migration in this country." "I believe that sustainable net migration is in the tens of thousands." Questions had been raised about whether the commitment would feature in the Conservative manifesto after Culture Secretary Karen Bradley said that immigration was "not about putting numbers on it" but about ensuring Britain had the skilled workers it needed. 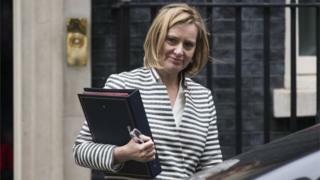 Asked whether she agreed with her colleague, Ms Rudd told BBC Radio 5live's Pienaar's Politics: "It's too early to say. I appreciate you want to push me on this but we are going to have to wait until the manifesto comes out." Pressed on the issue again, she added: "That's why we're having a new manifesto. It's not going to be identical to the last one. "We're setting it out for hopefully for a five year term, we've got a lot to think through to work out what's the best way to deliver on our priorities." She added: "My personal view is, we need to continue to bring immigration down. I want to make sure that we do it in a way that supports businesses, you know we're ending freedom of movement when we leaving the European Union. "So the situation from that time the  manifesto... has changed because we're leaving the European Union, so it's right that we look at it again." Ms Rudd also played down the potential impact of excluding students from net migration figures, saying: "It's a complete red herring to talk about taking students out of those numbers and it making a big impact." This was because, in theory, roughly the same numbers of students should be leaving the UK at the end of their courses as are arriving each year. Official figures out last month show EU migrants make up more than one in 10 manufacturing sector workers in the UK. The government has promised new migration controls after the UK leaves the EU, when freedom of movement rules will no longer apply, but it has yet to set out the precise model it will adopt. Labour says it accepts that the principle of the free movement of people - which EU leaders say goes hand-in-hand with single market membership - would have to end after Brexit. But shadow Brexit secretary Sir Keir Starmer has said new immigration controls should not be the "overarching priority" as the UK leaves. UKIP has said that Mrs May's failure to reduce net migration to less than 100,000 while she was home secretary suggests that she could yet "back slide" on delivering Brexit.